A busy freelance musician based in London, Will is the current holder of the Eric Thiman Memorial Award scholarship at the Royal Academy of Music, where he is studying with Professor Felix Schmidt. 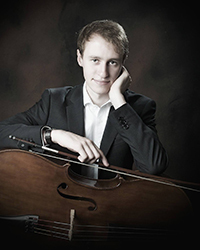 Beginning music lessons aged four, Will became proficient on a range of instruments before deciding to specialise in the ‘cello when moving to Chetham’s School of Music, Manchester, aged sixteen, where he studied with Head of Strings, Nicholas Jones. Now living in London, Will performs regularly with many different orchestras and ensembles whilst maintaining an exciting solo career. Upcoming solo performances include the Dvorak and Elgar concertos with orchestras throughout the UK. I am a PhD student of composition at Bath Spa University. Before my doctoral studies I completed an MA in Performance Design and Practice at Central Saint Martins College of Art and Design and a joint BA and MA in Music (Composition) at the Aristotle University of Thessaloniki. Apart from my academic studies I was lucky enough to have been taught the lyra by some great masters of Cretan music, such as Zacharias Spyridakis, Rodamanthos Androulakis and Dimitris Sgouros. John Cage’s 4’33’’ (1952). It is a piece where the performer(s) don’t produce any sound at all for the designated time interval. The soundscape of the piece is created thus by the environmental sounds, including those made by the audience. Extending the notion of “thing” to something that’s not an object, I could say that I cannot live without creativity. Felling creative is the most powerful feeling in my life, and quite addicting too. Second best thing would be to share this creativity with good friends and my family. In my compositional practice, my most profound influences would be those by John Cage, George Brecht, and my teacher and mentor, James Saunders. In my performance and music perception, I am highly influenced by some great musicians, some of which happened to be my teachers, like Zacharias Spyridakis, Dimitris Sgouros, Elias Andreoulakis (lyra) and Andreas Giakoumakis (Byzantine Music), and others who were not, like Andreas Rodinos, Kostas Mountakis, and Chris Thile among others. I grew up in the city of Heraklion in Crete, Greece. Crete is one of the most beautiful Greek islands, with a unique and alive music tradition.